PT Pengerukan Indonesia - Rukindo or known as IPC Dregding & Shipyard is an established and experienced marine company with core competencies in dredging and shipyard. 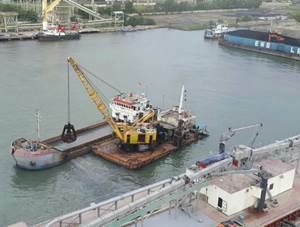 Rukindo has its business activities focused in dredging of sail navigation channel, port basin, reclamation and transportation of dredging products and shipyard. Rukindo is a subsidiary company of state-owned port operator PT Pelabuhan Indonesia II (Persero) or Indonesia Port Corporation (IPC Group). As of December 2016, Rukindo is 99.9% owned by PT Pelabuhan Indonesia II (Persero) and 1% by PT Pengembang Pelabuhan Indonesia. Rukindo was first established in 1991 and initially registered as a state-owned company under the name of PT Pengerukan Indonesia (Persero). Since 5 Juny 2014, Rukindo has officially operated as a subsidiary company of PT Pelabuhan Indonesia II (Persero). Rukindo is based in Jakarta and its corporate office is situated in Jl Raya Ancol Baru, Ancol Timur Jakarta 14310. In the business year of 2016, Rukindo was able to achieve a better performance compared to 2015. According to managed to PT Pengerukan Indonesia Annual Report 2016 as cited by JobsCDC.com, Rukindo successfully recorded a total comprehensive income of Rp 15.04 billion in 2016. In the business year of 2015, Rukindo reported total net loss of Rp 32.34 billion. Rukindo booked total assets of Rp 88.95 billion in 2016. This number is up 13.77% from Rp329.1 billion in 2014. Education S1 Civil Engineering Construction. Good English language skills, both oral and written. Computer literate (Ms. Word, Ms. Excel, Ms. PowerPoint and Internet). Willing to undergo office bond for at least 5 years. Preferably have relevant work experience. JobsCDC.com now available on android device. Download now on Google Play here. Please be aware of recruitment fraud. The entire stage of this selection process is free of charge. PT Pengerukan Indonesia - HSSEQ Risk Management Staff Rukindo IPC Group February 2018 will never ask for fees or upfront payments for any purposes during the recruitment process such as transportation and accommodation.